"This cake gets rave reviews every time it's made. Definitely not for anyone on a diet! Oooey-gooey, and oh! so good! Best if served warm with vanilla ice cream." Preheat oven to 350 degrees F (175 degrees C). Grease and flour a 9 inch springform pan. In a large bowl, combine flour, sugar, baking soda, and baking powder. 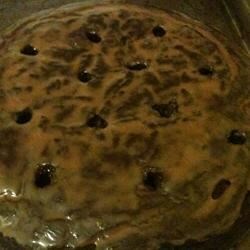 Make a well in the center, and pour in melted chocolate, coffee, sour cream, and oil. Mix well, and spread into prepared pan. Bake in the preheated oven for 50 to 60 minutes, or until a toothpick inserted into the center of the cake comes out clean. Cool for 10 minutes, then remove from pan. In a microwave-safe bowl, combine caramels and milk. Heat in microwave until melted. Stir until smooth. With a wooden spoon, poke holes into the cake. Pour caramel mixture into holes. I am anxious to try this recipe. I have a much more basic recipe. It suggests you use a jar of carmel ice cream topping to pour over the top which might be easier. I don't know why but the cake came out tasting like clay. I don't think I will try this recipe again. Using Werther's Original for the caramel topping was sooooo good! If you like gooey and sweet & chocolate and caramel, this is a 5-star recipe.